Prague is the capital of the Czech Republic. The city is over 1,000 years old and has had an eventful history – in recent times alone it’s been occupied by Nazis and ruled by oppressive communism. It’s now a democracy and tourists flock there from all over the world. In 1993 Czechoslovakia split into two and the Czech Republic was founded alongside Slovakia. Its capital is a beautiful city famous for its red-roofed vistas, magnificent architecture, cobbled streets and rich culture. Oh and there’s a surprisingly varied amount of great food to enjoy, too. The city is an extremely popular tourist destination and the streets were packed on the three sunny August days I spent there. So you’re gonna just have to go with the crowds. Just make sure you reserve your restaurants and any other activities well in advance. Here’s what you have to do on your visit. The imposing Charles Bridge was built by King Charles IV and finished around 1402. 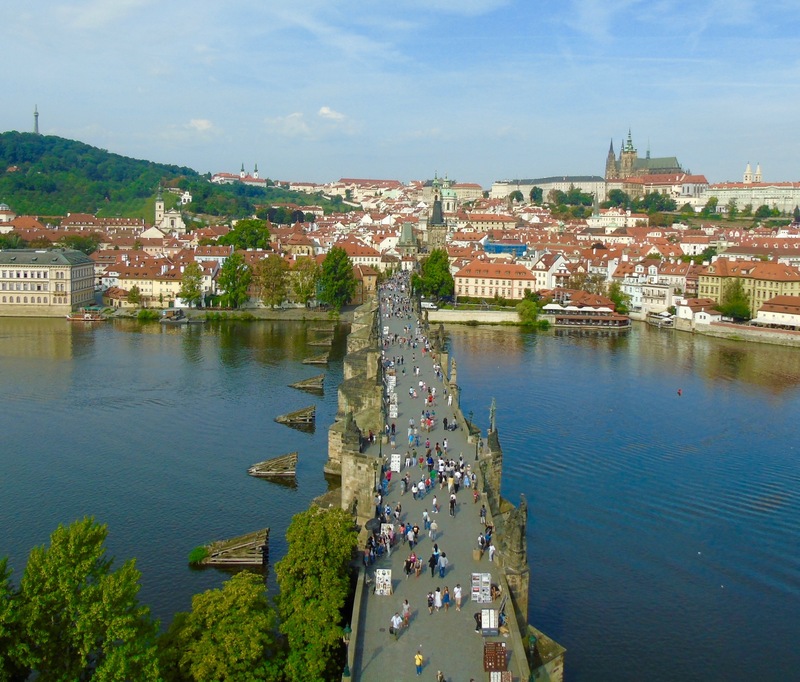 It spans the Vltava River, leading from the Old Town towards Prague Castle. There are 30 statues along the bridge, mainly Baroque style, including the statue of St John of Nepomuk. Touching the priest on the plaque of this statue is said to bring good luck and ensure your return to Prague. Worth a try. You’ll find it by looking for the shiny gold spots created by so many people rubbing it! Both the views and the bridge itself are amazing making it rather popular. It’s hard to move after about 10am with buskers, street vendors and tourists fighting for space. Get up early if you want a more peaceful experience. 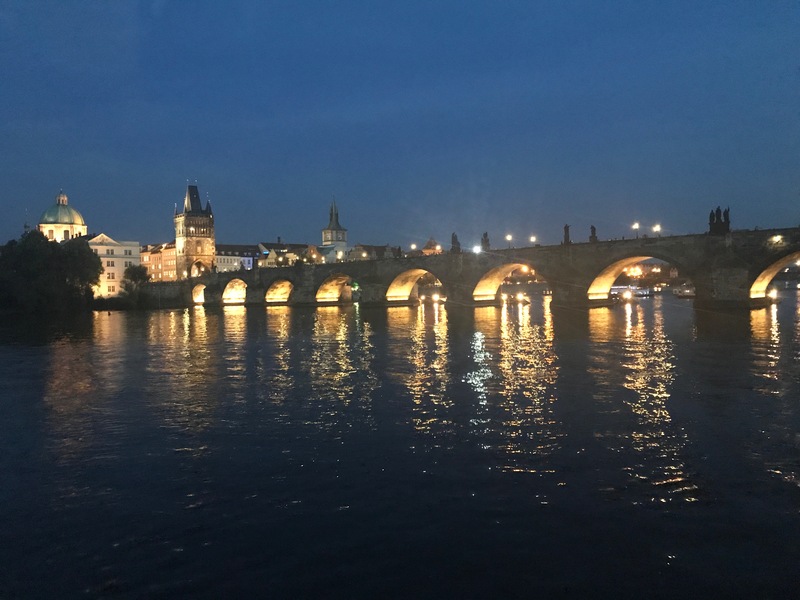 Just across the Charles Bridge, Mala Strana, also known as Lesser Town, is a hillside area of the city that dates back to the mid 13th century. It lies at the foothills of Prague Castle with views across the Vtlana towards the Old Town. The streets are lined with charming bars, restaurants and shops and canals with the feel of a mini Venice. 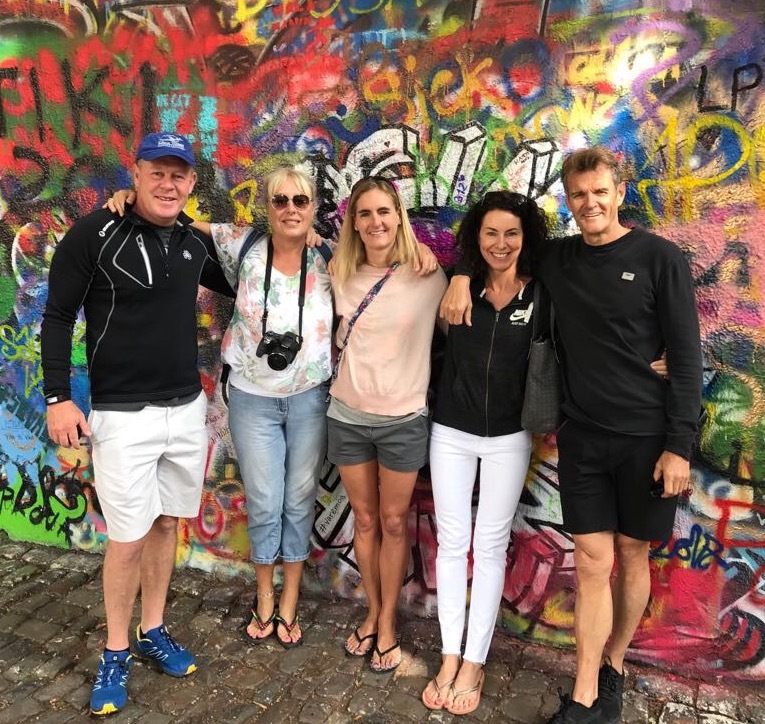 It’s also home to the surprising Lennon Wall. John Lennon was highly admired by young Czechs and after his death they painted the wall with Beatles lyrics and other Lennon-inspired graffiti. It’s a beautifully colourful symbol of peace, love and freedom. There’s even a John Lennon pub nearby where you can take a break and sample the local beer. A river trip gives you a different perspective of a city. We went in style on the Four Season’s electric boat, complete with a fabulous guide and Prosecco all round. A great opportunity to learn more about the city’s history and cruise along the Venice-like canals of Lesser Town. Dominating the beautiful red Prague skyline, Prague Castle is the largest ancient castle in the world at 70,000 square metres. It dates back to the 9th century and is set on a hill overlooking the city. Which means you’ll have a good workout getting there (and a scenic one) and the views from the Castle are almost as impressive as the Castle itself. 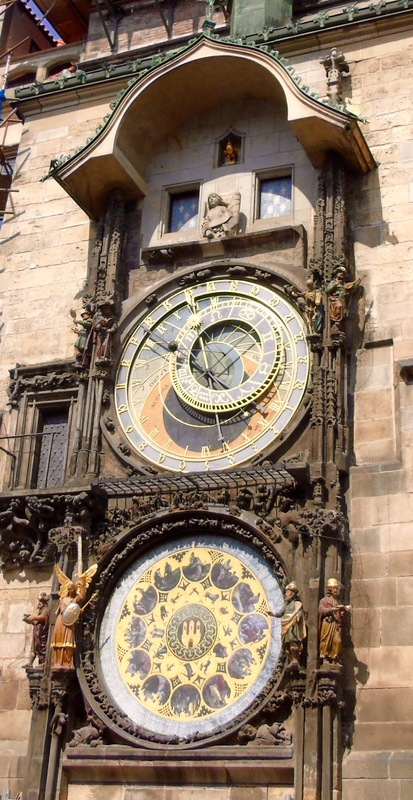 Old Town Square is set between Wenceslas Square and the Charles Bridge. This stylish square displays architectural styles spanning several centuries. 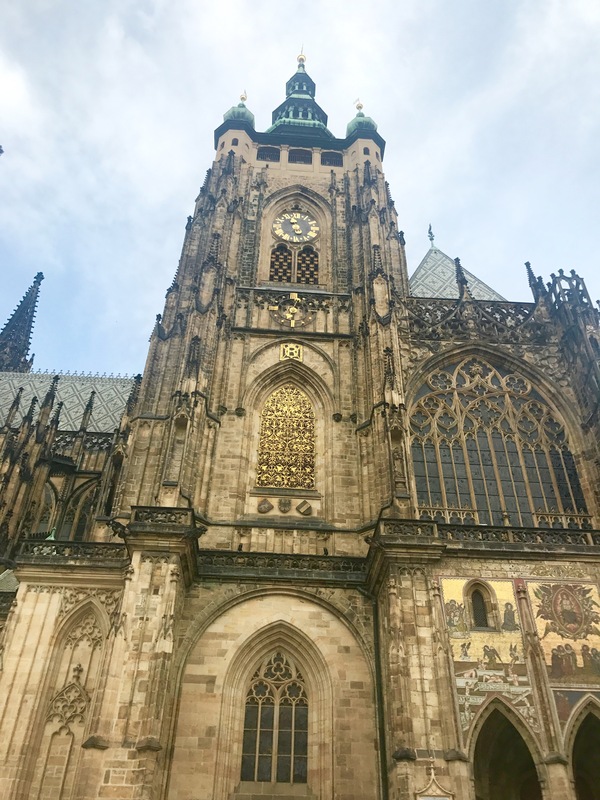 It’s dominated by a beautiful Gothic Church and the Old Town Hall which houses Prague Orloj, the incredibly beautiful and intricate astronomical clock. It was installed in 1410, making it the third oldest in the world and the oldest still in operation. Amazing that it still works. There’s a fantastic moving display every hour on the hour when you’ll see the whole mechanism in action with statues appearing through doors. It’s definitely a highlight of the city – so be prepared for huge crowds again. The Czechs are the biggest consumers of beer in the world. They manage to down around 143 litres a head every year. It’s not surprising – the beer is delicious and there are many different ones to try. I stayed in the Hotel u Medividku on the edge of the Old Town which is also one of the oldest mini breweries in Europe (more about the hotel later). A welcome tankard of delicious beer at check in meant a good start to our stay. 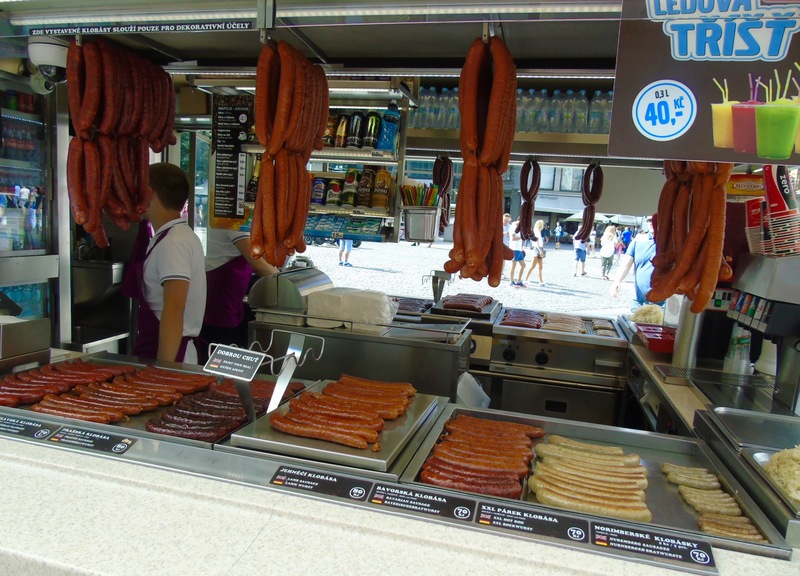 There are sausage stalls along Wenceslas Square with a wide range of tempting offers – though I suspect tourists are their main customers. They did smell delicious though. And most restaurants have a sausage dish on their menus. I sampled plenty of flavoursome, quality sausages which were usually served simply with mustard or horseradish. 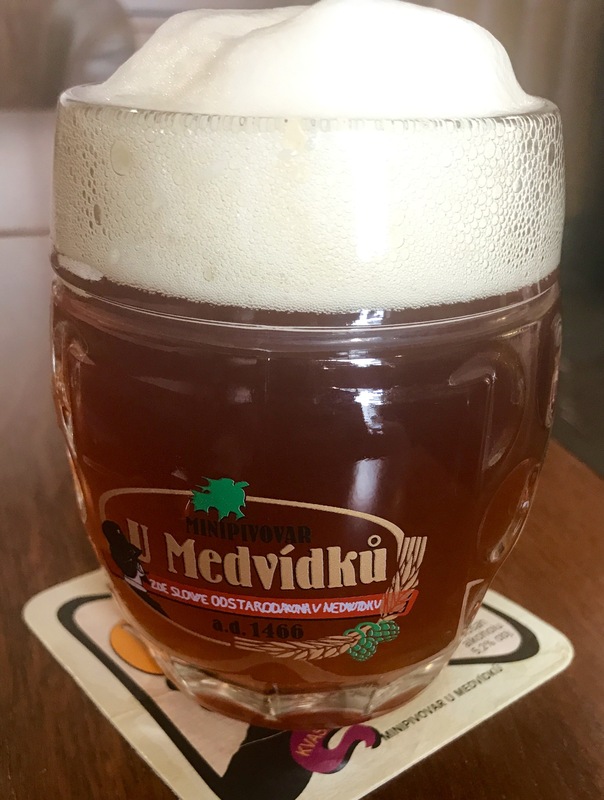 We shared a tasty selection at Mincovna in Old Town Square. In the 17th and 18th century Prague was known as the conservatory of Europe. Czech composers Smetana and Dvorak were born here and Mozart lived here after he left Vienna. 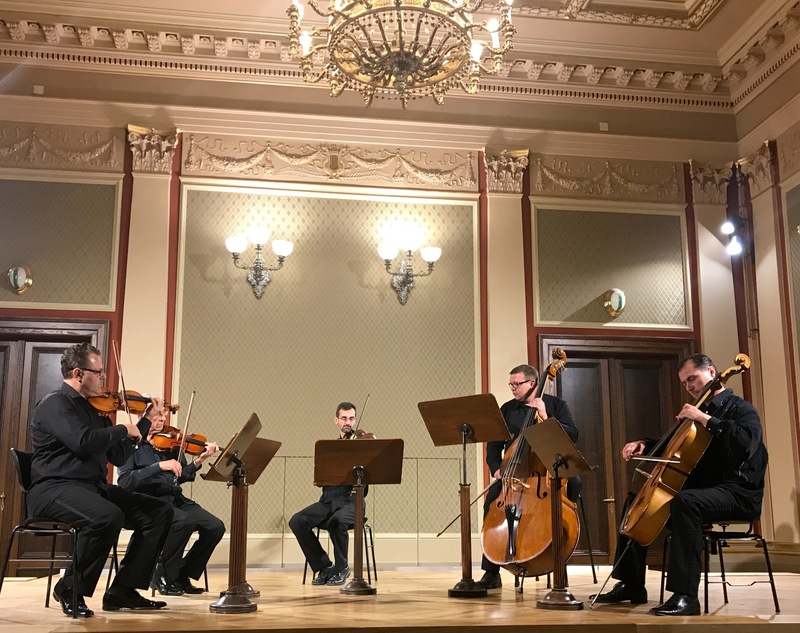 There are concerts advertised everywhere and we went classical, enjoying a fabulous hour listening to this string quintet in the grandeur of what used to be the Gestapo headquarters during World War II. I’m glad I was there in happier times. 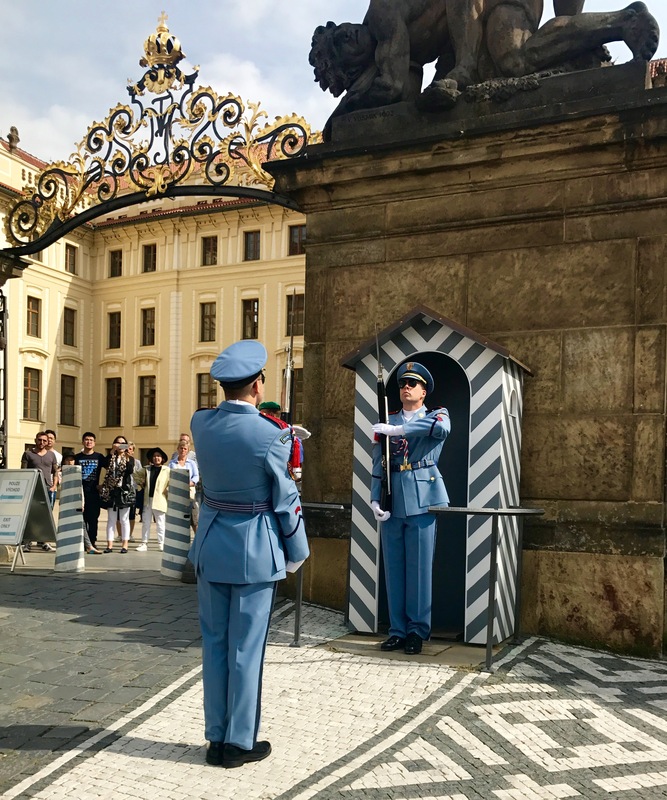 There’s also great Jazz to be discovered and I have to say that the buskers on Charles Bridge were pretty impressive, too. This towering cathedral is the largest church in the country and a magnificent example of Gothic architecture. It’s right next to the Castle and was constructed in stages with the initial church being erected in 930. It’s vast inside with magnificent stained windows and just as an impressive exterior. 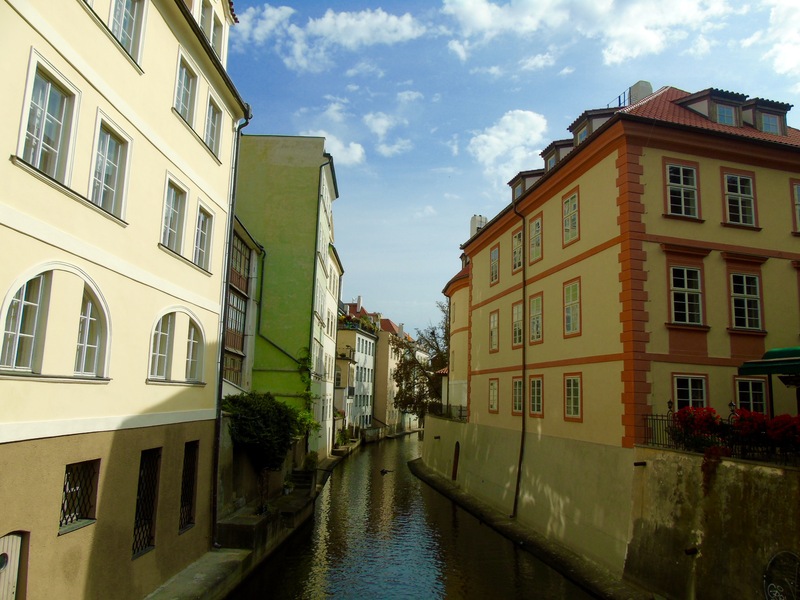 Despite its turbulent history, the Jewish Quarter in Prague is the best-preserved Jewish historical complex in Europe. 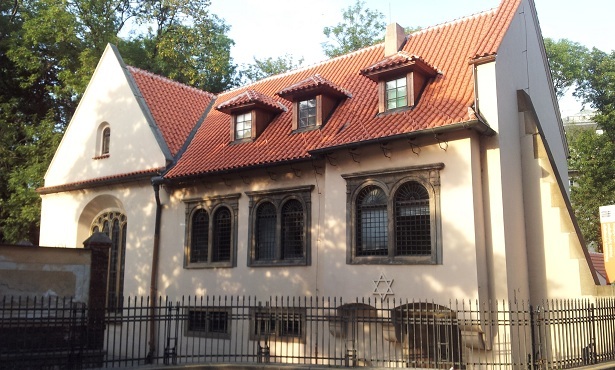 The former Jewish ghetto has myriad tales to tell and you can visit the weathered tombstones of the old Jewish cemetery and the Pinkas synagogue which is now a Holocaust museum. The names of Czech Holocaust victims are written on the synagogue’s inner wall – nearly 80,000 of them. It’s an impactful and horrifying sight. It’s hard to choose where to eat in Prague, there’s just so much choice! 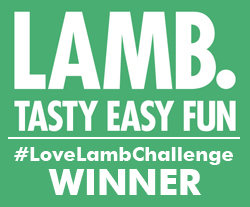 We did find some real gems, though I know we only scratched the surface – it’s certainly a city for food lovers. You can read about our amazing lunch at Terasa u Zlate Studne by clicking here. Watch this space for more restaurant recommendations coming soon. We stayed at the Hotel U Medvidku on the edge of Prague’s Old Town. Our room was really spacious and comfortable with a newly refurbished bathroom with large shower. It’s a historical, characterful hotel set on a quiet street easy walking distance from all Prague’s sights. 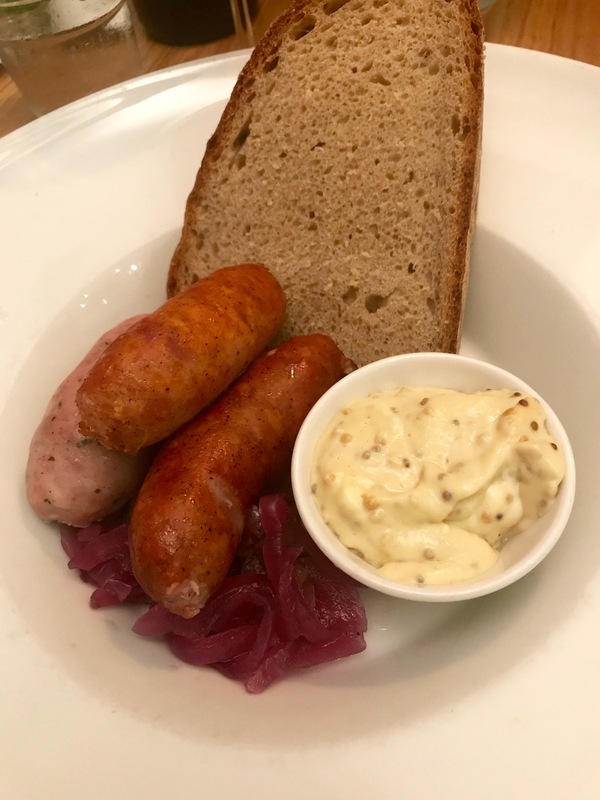 The service was friendly, welcoming and helpful, a good breakfast spread is served in the restaurant and it’s also got something extra special – an onsite mini brewery. 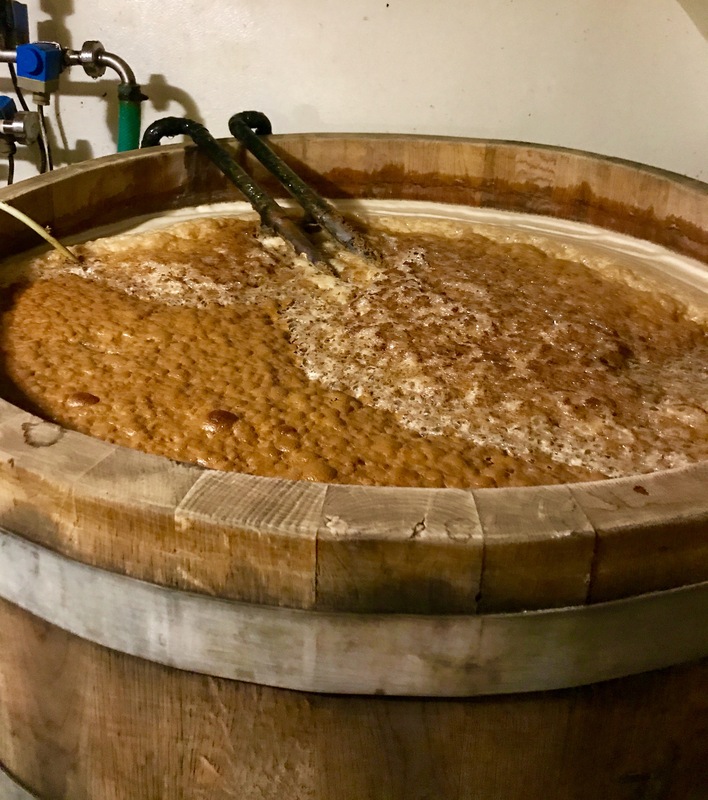 One of the older in the country, in fact – the original brewery was founded in 1466. You can do beer tastings or try their beer ice cream. I’d never seen beer brewing before so that was quite fascinating. And of course we had to try some of their delicious brews. That hotel/brewery combination works for me.